While taking the shots for the previous post, a fisherman walk in from nowhere and started pulling the boat. I just managed one shot before he moved on and here is the result..
Nikon D810, 21mm Zeiss Lens. 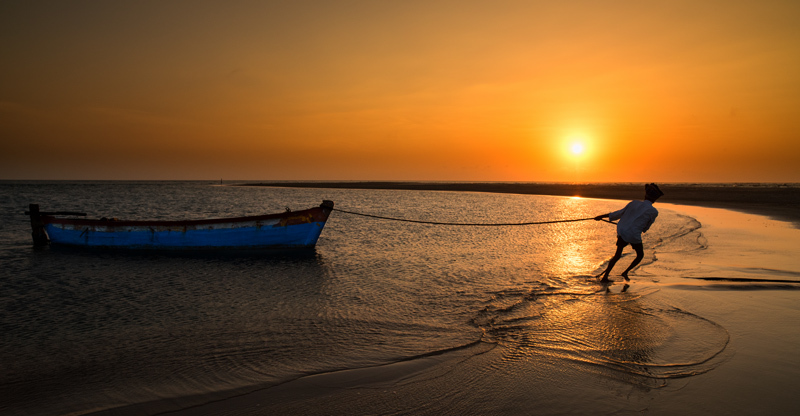 A great story telling image with the silhouette leaning forward and pulling the boat toward land. The lighting and the composition are excellent. Love this- beautiful light and early morning mood with and excellent action silhouette to top it off. Top notch! Beautiful scene and wonderful light, Srirama. A fine story telling image!